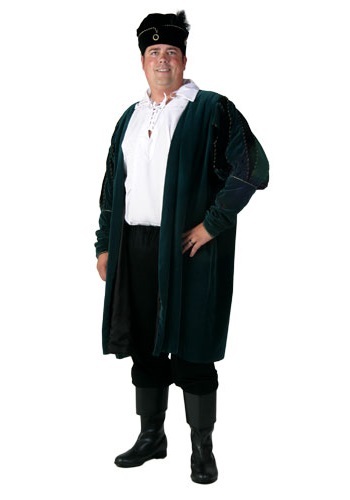 Become a chivalrous nobleman of the Renaissance era with this classic look. The costume comes with a white, polyester shirt featuring a v-neck that laces up corset style. The pants are black with an elastic waist. The coat is hunter green velvet; it has form fitting sleeves to the elbows where it then poofs with stripes of black velvet and gold embellished cording for the look of a courtier. The hat is black with black and gold button embellishments and a feather.